Innokin recently announced their new AIO Pack, an portable charging case (PCC) that can charge up your e-cigarette on the go… and then some. The Innokin AIO takes the handy charging pack concept and adds a few interesting features to the mix. Let’s take a look at Innokin’s AIO pack and see if it’s full of utility or gimmicks. 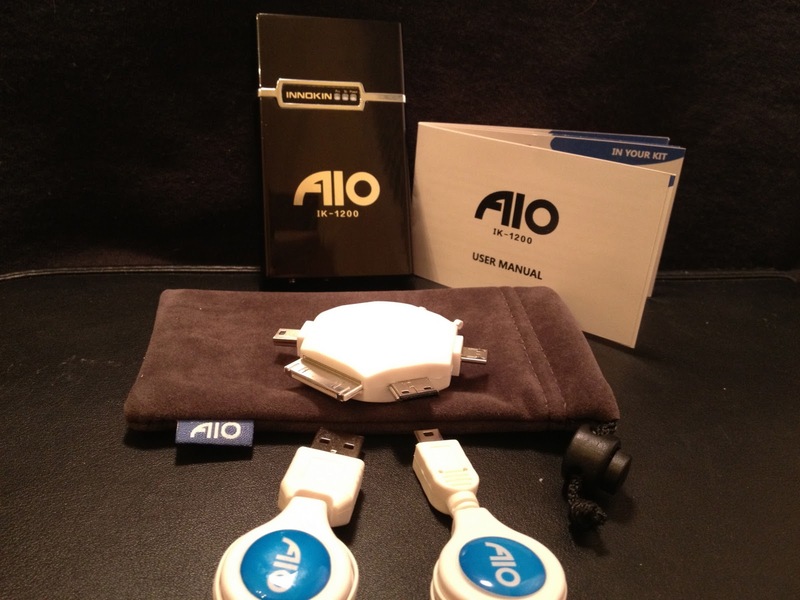 According to my contact person at Innokin, the AIO will likely be released as a starter kit when it hits the market. So you can probably add at least one e-cigarette battery, some cartomizers and maybe a couple other accessories to the list. Innokin sent me one of their AIO IK-1200 packs. From a purely superficial way, the AIO is an attractive little device. The case is about the same height and width as a regular pack of smokes, but about 1/2 to 2/3 the thickness. The size makes it ideal for putting in a pocket or bag.The case is made of metal and has a glossy finish. There are some chromed plastic accent pieces that look nice but do slightly cheapen the overall feel of the AIO. There’s also a small vent on the side of the AIO for safety in the event of battery disaster. On the front of the case is the AIO logo and a set of three small LEDs. These lights are the status indicator and change color from green to yellow to red to indicate charge levels. There is a separate light for both the case’s battery life and the remaining juice in the battery riding inside the case. This is a nice touch, since many PCCs share status indicators for both e-cigarette and case batteries. 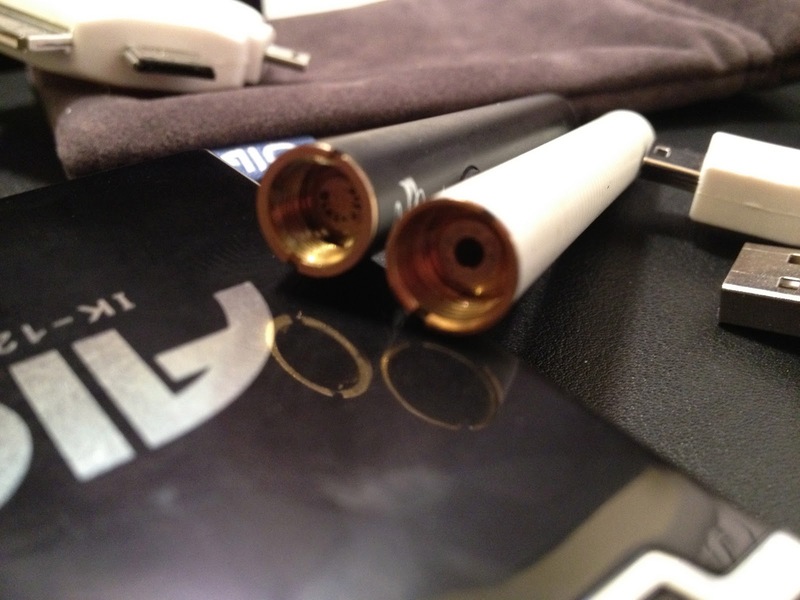 Accessing the e-cigarette and cartomizers inside is a simple matter of removing the top part of the case. One minor annoyance about this: the cap doesn’t fit onto the bottom of the case when removed, so it sort of just sits around loose. This shouldn’t be a huge problem since most of the time the case will be closed. Inside the case sits four slots. One for the universal e-cigarette battery charger (more on this in a minute) and three spots to stow cartomizers or atomizers. The battery slot is even notched to accomodate either automatic or manual e-cigarette batteries. It’s important to note, there is no slot for changing out the 1020mAh battery like there is with the Smokeless Image Volt kit I reviewed a while back. Replaceable batteries aren’t all that common in PCCs. Still it would have been a nice addition with all the features the AIO packs into a little box. 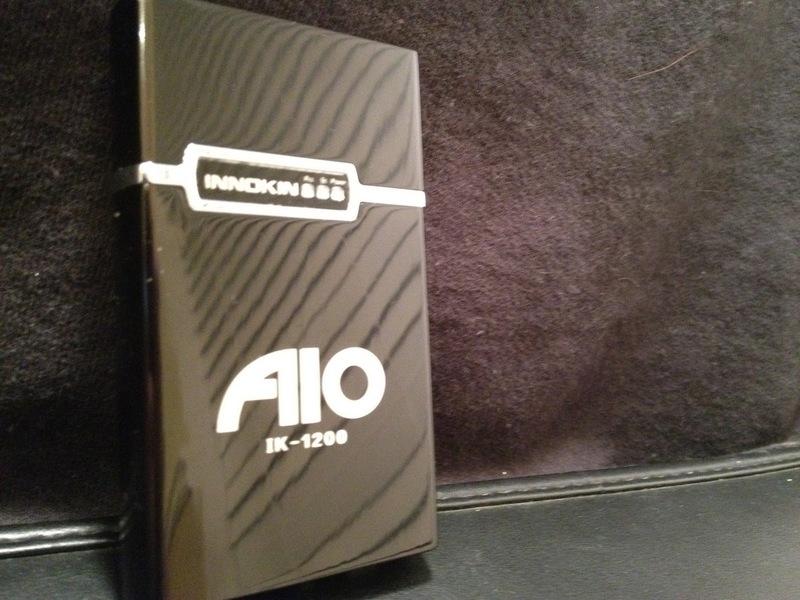 Other than a pretty design, so far the Innokin AIO isn’t that much different than any other e-cigarette charging case. Look at the bottom of the case, however, and you may notice something a little bit different about this e-cigarette charging case. In addition an on/off switch, a button to activate the status LEDs and a power in port, there’s a 4th port. This port is a mini-USB port for power OUT. Not only can the Innokin AIO charge e-cigarette batteries, it can also charge many portable electronic devices. Thanks to the oddball adapter accessory, you can charge just about anything, actually. There’s both mini and micro USB connectors as well as iPhone, Sony, Nokia and Samsung connectors. That should cover you for about anything (including an eGo pass-through). I was even able to charge my iPhone 4S and a 510 battery at the same time. For some reason my old iPhone 3GS didn’t like the AIO and wouldn’t charge off of it. Of course with only a 1020 mAh battery, don’t expect to fully charge a phone and a bunch of batteries. Real-world you should be able to get 4 maybe 5 charges on your standard e-cigarette battery before needing to recharge the pack. 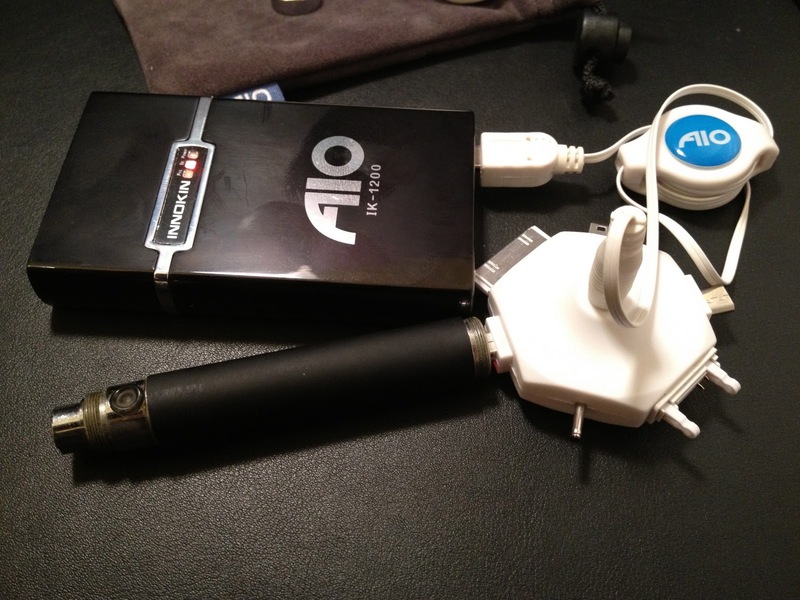 If you’re strapped for chargers, the AIO can charge your e-cig battery while the case is being charged via USB itself. 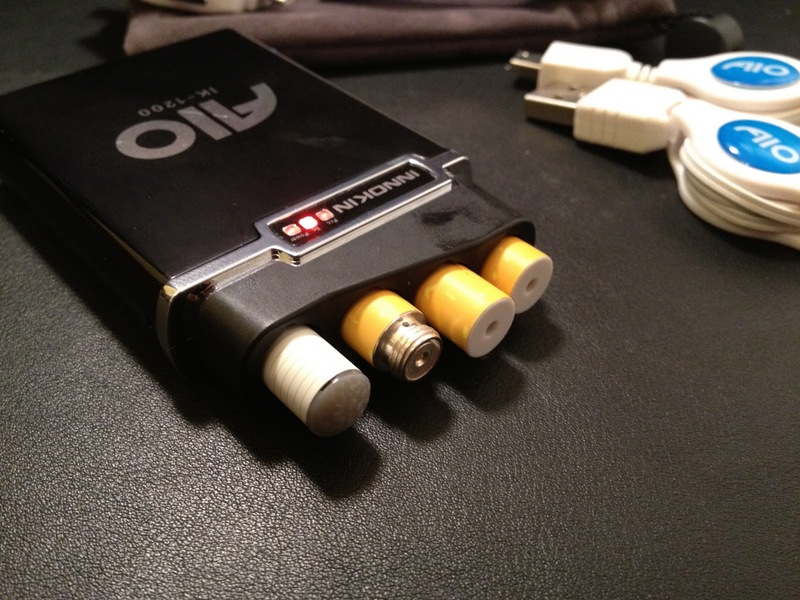 There is one other thing that makes the AIO interesting among electronic cigarette charging cases. The AIO is a universal case (sort of). Unlike most charging cases which connect to the battery with a screw-on connection, the AIO has a friction-fed system. Simply push down the battery until it catches and the charging mechanism will engage. The case will work regardless of thread pattern. I was able to charge both 510 and RN4081 batteries with the case. There are some proprietary batteries out there that have the polarity reversed (the center pin is the negative terminal). The AIO can’t charge these batteries. Nothing bad will happen, it just won’t charge them. The case does require the battery have a female connector. There is another version of the AIO, the IK-1201 which has a female connector for batteries like the KR808-D1. Thanks to the notch in the battery port, both automatic and batteries worked in the case without a hitch. Any length batteries would work, in theory. However, the cap isn’t deep enough to be able to close if you stuck a 510 XL battery or something similar in there. Most people pick a battery design and stick with it, but if you happen to be agnostic about your e-cigarettes, or are planning a transition, the universal feature could help cut down the desktop clutter. 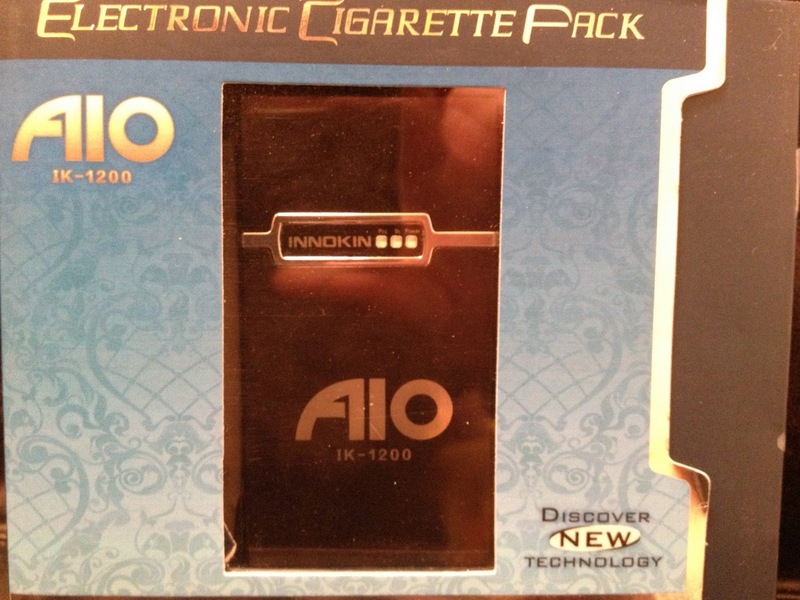 The Innokin AIO IK-1200 is an attractive and compact universal e-cigarette charging case. The pack looks good and feels solid, save for the plastic trim. The ability to charge most any portable device (or even more electronic cigarettes) is a handy feature. There are a few small issues, but they aren’t enough to outweigh the benefits of the device, especially for users who want the flexibility the AIO offers. Disclosure: This device was provided to me for review by the manufacturer, Innokin. While this is a production model, it is not yet on the market and may be subject to change when it does hit the market. CE3 XL Clearomizers Review – Better than the Smokymizer? PREVIOUS POST Previous post: e-Cigarette News Update 12/9/11: The Jig is Up!